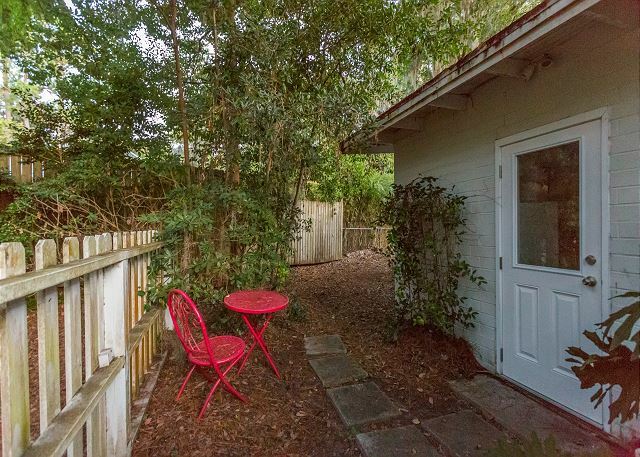 Real Escapes Properties is pleased to offer a little hideaway among the oaks. This unit sits behind its main home "Moon Dance", across the street from Mallory Park, just north of the Village/Pier!. It is a 350 square foot open floor efficiency which holds a queen sized bed, a sleep sofa, and a full bath. There is also a two burner stove and a refrigerator. Sorry no Oven! WiFi internet provided. The was great but the parking was not good having to park away from the house with poor lighting at night. It was close to most things on Mallory street. Love where it was,but inside floor was nasty,I moped with wet bleach wipes,there was no mop.The outside was horrible,There has been no upkeep to the sitting area at all,we could not enjoy one minute outside and it is described as a place to enjoy,not.We were so dissatisfied with it,The cottage is in such a tranquil setting it's a shame it had been forgotten about.But we loved the pier so that was our outdoor living. Enjoyed stay. Not having an oven is difficult when you are in a place for a month. Great! But the heatpump unit needs attention - dropping soot on the floor around the night stand on the left of the bed. Very nice property. We had a great time!